Giving gifts is often a challenge. As a woman of impact, influence and faith, I’ve made it a point to shop consciously, on budget and on purpose, as often as I can, especially at Christmas. I’ve been a teacher of social enterprise to tweens and teens, and it’s my true pleasure to compile this list of companies that give back, featuring gifts that support and donate to charity this holiday season. Do you know any organizations or businesses that should make the list next year? 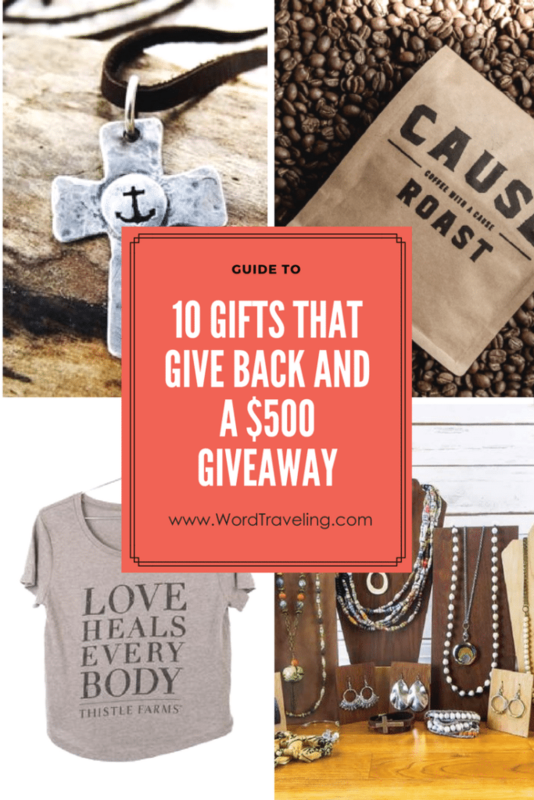 Make sure you enter the giveaway for the World Vision holiday gifts below, valued at over $500 and leave a comment if you have other ideas! This post contains some affiliate links that help support the costs associated with bringing you awesome content. You can spread the love of Jesus this holiday season through this charity and sustainable gifts for others in less developed countries can use. One option is the giving the gift of livestock or crops. 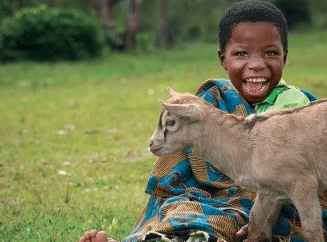 For example, goats can produce milk with easy-to-digest protein and lots of calcium, important for healthy bones and fertilizer to help the crops grow. The gifts of fruit trees, nature’s candy, to a village can feed a family, start a business, and be a super source of nourishment for years to come. And can we talk about, probably, the most popular sport around the world? 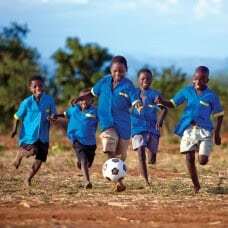 By donating, through your purchase, light up a child’s life with the simple gift of a soccer ball. When a donation is made to World Vision’s “Where Most Needed” fund, you can choose from different items (like the ones listed below) to receive as a meaningful memento of your gift. These items are treasures, for yourself or to share with someone as a perfect present this Christmas season. I’m so thankful to be partnered with World Vision to bring you this post and to share these gifts with my loved ones this Christmas. 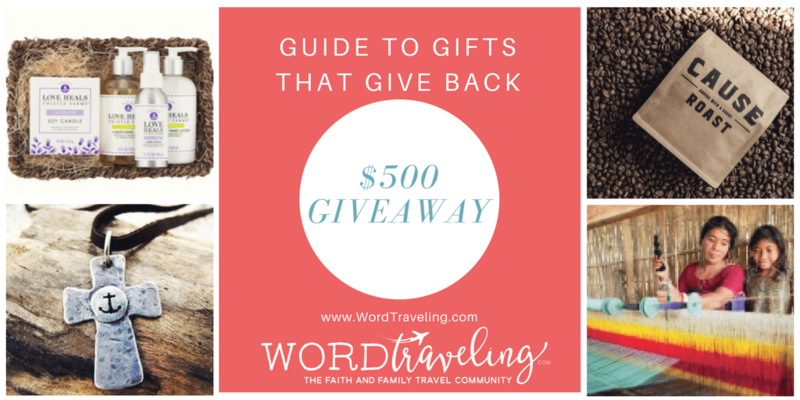 One of our readers will WIN an entire gift package, valued over $500! Sign up at the bottom of this post! Vietnamese Tote ($100) – Disabled Vietnamese women gain independence by creating these beautiful hand-embroidered purses. I’m giving this one to my college-aged niece for Christmas. Infinity Scarf ($75) – This fashion-forward accessory is made by artisans in India who are trained in the loom industry to attain skills and a sustainable livelihood. I really wanted to keep this for myself, but my son Luke insisted it was for my grandmother for Christmas to match her eyes! It’s gorgeous! To order from World Vision’s Gift Catalog, call 855-WV-GIFTS or use this direct link. The charity of Thistle Farms’ mission is to HEAL, EMPOWER, AND EMPLOY women survivors of trafficking, prostitution, and addiction. We do this by providing safe and supportive housing, the opportunity for economic independence, and a strong community of advocates and partners. Founded by an Episcopal minister, Becca Stevens, their fantastic products range from personal care to apparel, jewelry and books. 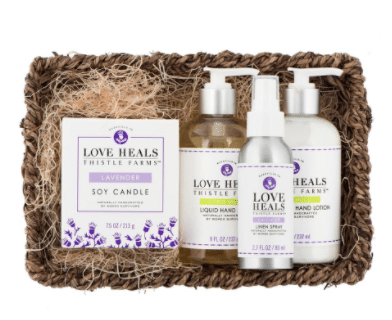 I love their #LoveHeals theme, in this t-shirt ($24) or this gift basket with soy-based candle, natural lotion, room spray and soap. 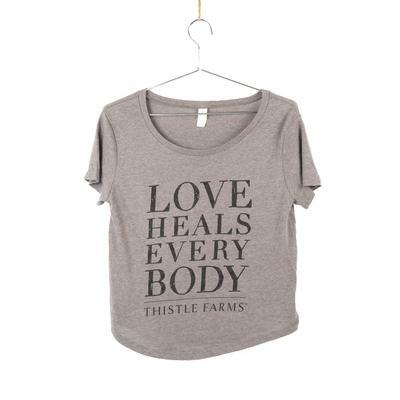 $60.00 Shop Thistle Farms here. Vi Bella means “beautiful life” and that’s just what this social enterprise jewelry company strives to create through their job-creation ministry. They sell beautiful jewelry that is creating hope and healing in communities in Haiti and Mexico. Vi Bella is on the front lines, fighting poverty every day. They believe in reaching out to hold hands, because we are all in this together. And together we can make the world a better place. When you choose Vi Bella, your purchases create sustainable employment for a mother who no longer looks at an orphanage as the only hope for raising her daughter. It reclaims the landscape through our recycled materials. And your purchase makes your life, and theirs more beautiful. After Vi Bella was established in 2011, their fundraising program was created to support others doing great work. Vi Bella loves linking arms with organizations and using the handmade jewelry created by their artisans to further other causes. In addition to having a national sales team of storytellers (their beautiful life ambassadors) Vi Bella also links arms and donates 30% of sales to non-profits and mission work of others who set up a fundraiser! Their scripture as a company is Micah 6:8, and they pray to love as Christ loved us, walking humbly alongside employees, artisans, communities, and customers. 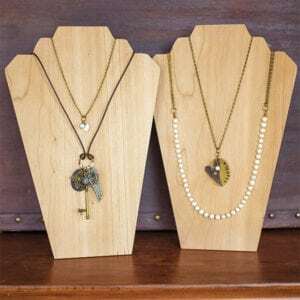 Grab your life-giving jewelry and accessory gifts here. The Starling Project aims to donate a light for a light, with the goal of providing solar energy around the world with every purchase of a candle. Sustainable, long-term solar power provides light, safety, health, education for a safe and healthy life. Each candle burns for more than 60 hours, and is composed of soy wax, recycled glass, cotton wicks and ethically-sourced essential oils. I love their story, and have myself been entranced watching the collective power of a flock of starlings in flight. Mercy Ships, a faith-based, global nonprofit that provides free medical treatment and health care education in areas where care is limited or non-existent. They operate the world’s largest private hospital ship, entirely run by volunteers. 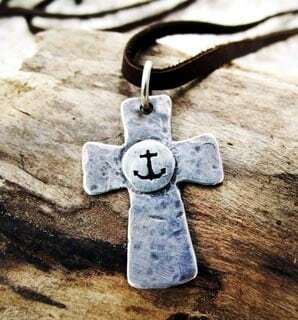 You can browse their extensive line of products, like my favorites, the MERCY t-shirt ($25) and rugged cross and anchor necklace ($45), all which give back. And, you can support them by donating medical care in a loved one’s name, and in prayer. Shop or donate to Mercy Ships gift here. 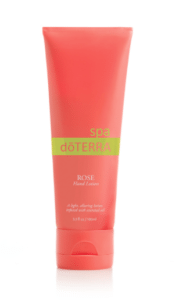 With each application of doTERRA Hope Touch, or Spa Rose lotion, breathe in the uplifting scent while knowing your purchase is part of a bigger cause—to help rescue precious children throughout the world. 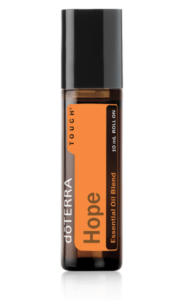 Contact me if you’re interested in learning more about doTERRA and opening your own wholesale account, saving 25% + on purchases. 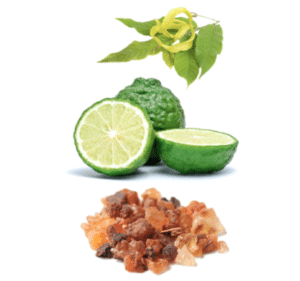 And, for the month of November, most starter kits are 20% off! I’ve been loaning and re-investing micro-loan funds on KIVA for years now in honor of friends and family. 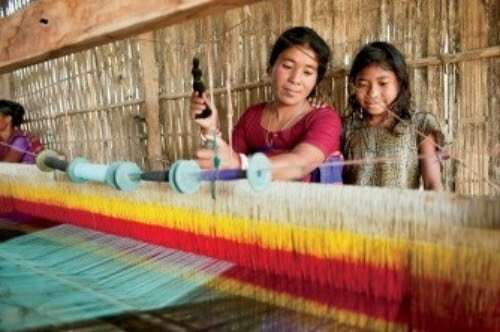 According to their site, “Kiva is an international nonprofit, founded in 2005, with a mission to connect people through lending to alleviate poverty. They celebrate and support people looking to create a better future for themselves, their families and their communities. 100% of every dollar you lend on Kiva goes to funding loans. Kiva covers costs primarily through optional donations, as well as through support from grants and sponsors.” This month for #GivingTuesday, if you purchase $50 in KIVA loans, you’ll receive and extra $25 to lend! TOMS is an awesome purveyor of cool shoes, clothes, sunglasses, bags, and coffee. TOMS are also known for their One for One®. When you purchase something from TOMS, they give something back for someone in need, such as the gift of shoes, sight, water, safe birth, or kindness, depending on the product purchased. They have collaborated and continue to partner with many local organizations in over 70 countries to provide help and improve lives. It all started with the shoes, and has gone far beyond. Melissa, our awesome Word Traveling assistant, has at least a dozen pairs of TOMS shoes and wore them on our recent trip to the Museum of the Bible. Humans were made for community. We need each other. 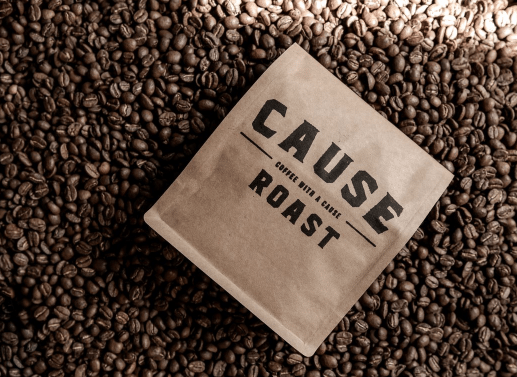 At Cause Roast, they don’t want work alone, so they partner with some of the best roasters, most sustainable causes, and the highest quality brands in the world to provide clean water with every cup. And, the coffee is amazing! Because I believe that travel is the best gift, giving your presence instead of just presents, why not combine a family cruise with a chance to serve? We traveled with FATHOM cruise lines last year, and January 20, 2018, they are partnering with Princess cruises to sail and be the hands and feet of hurricane relief after storms Irma and Maria to some of the most needed Caribbean destinations, including Antigua, St. Thomas, St. Maarten and Amber Cove, Dominican Republic. Join Fathom as they Cruise for the Caribbean. Details here. You never know, we may be joining you. Whichever way you shop this Christmas, be conscious in your choices, with your budgets and your gift giving, and consider donating to charity and giving gifts that support greater purpose than just gifts under your tree. Remember to share this post and enter the giveaway below, valued at $500!